If you are shipping cartons directly to your customers, you are undoubtedly aware of the importance of choosing proper packaging to ensure the safety of your products throughout the distribution channel.This chart compares typical ROI for plastic, pressure-sensitive tape with water-activated tape. 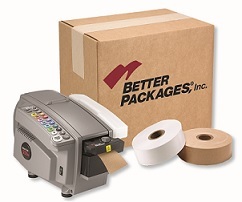 Copyright ©2015 Better Packages | Ansonia, CT (203) 926-3700. All rights reserved.